I am excited to publish this captivating interview with Andrea Krey – a Savannah photographer and print artist. She is most passionate about maternity, newborn and baby portraits, with a high emphasis on motherhood photography. Her approach and style to photography can be best described as natural, timeless and pure. She believes in the power of printed photographs to preserve family history – posed moments, candid moments, and everything in between. We are lucky enough to have her as devoted customer pleasing our eyes with her gorgeous work of art. I am thrilled to share it with you in this blog post. 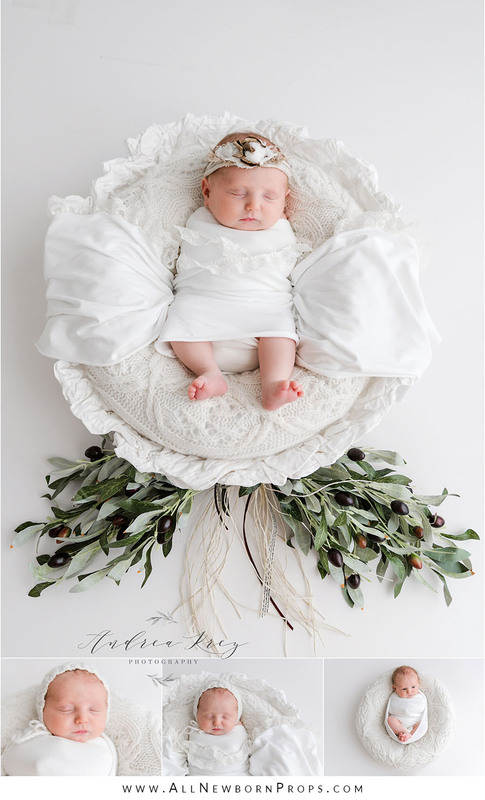 discover how perfect newborn props and neutral white colour can help you to create unforgettable and timeless images for your clients. We are curious to hear about yourself. Please introduce! My name is Andrea Krey, born and raised in Germany. In 2011 I listened to my heart and moved with my Airman to the US. We have two children (21 and 8 years old) and the sweetest Chihuahua named Joy. Traveling, decorating and Netflix binge watching are my favorite things to do besides photographing and cuddling my clients’ babies. 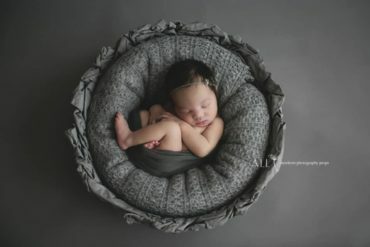 I specialize in maternity, newborn and baby photography in Richmond Hill, Georgia, not far away from beautiful and historic Savannah. I have a boutique photography studio in my home and provide my clients with a luxury studio wardrobe for mommy and babies up to 18 months to use during their maternity and newborn portrait sessions. As a full service photographer I pride myself in planning and curating everything for my customers to their taste and needs. All they have to do on session date is to show up. Get the FREE Awesome eBook! Are you struggling to prepare set ups for your newborn photography sessions? Sign up for our newsletter and get instant access to the eBook & learn how to create stunning and impactful photographs your clients will rave about. Subscribe to get the awesome eBook NOW! How long have you been in photography business? And how many years have you been shooting newborns? I have been in business since January 2016 and started to photograph newborns in October of the same year. Why did you choose the niche of newborn photography? What do you enjoy the most about it? I have always been interested in photography growing up, but never really got into it, besides a few kid’s model jobs in front of the camera. When I had my sweet daughter in 2010 and we booked a hospital newborn session, I could really see myself photographing babies. We had just bought our first digital camera and it was just as good as the hospital photographer’s camera. I was convinced, that I can absolutely do newborn photography with my fancy new camera, little did I know. 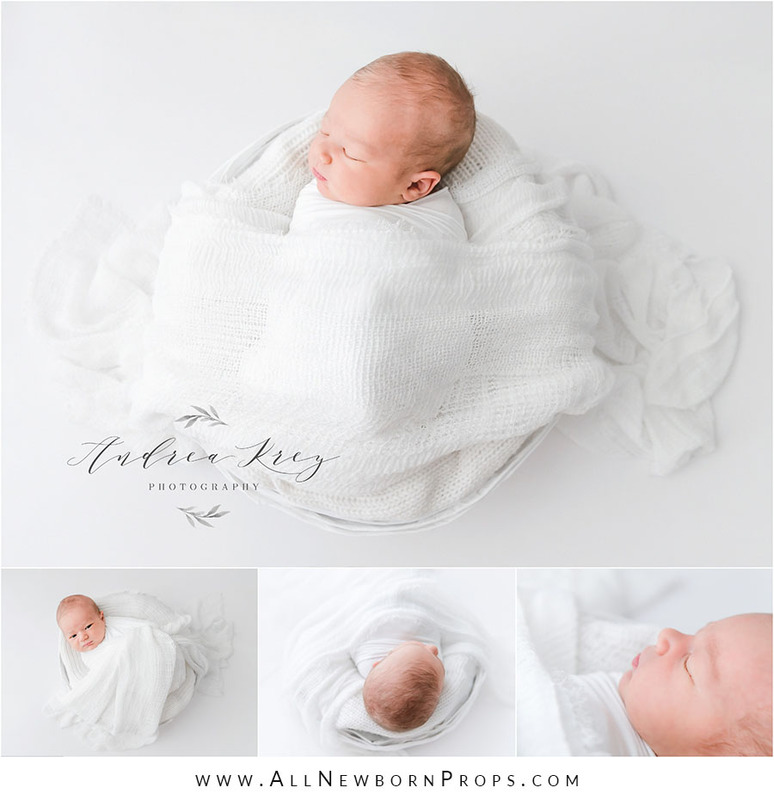 After I took a few courses over the years I found out that newborn photography is not easy at all, but I was challenged by learning all the ins and outs of newborn photography and loved it and knew that this is what I want to do. Handling and soothing fresh babies is my favorite thing to do. Helping new parents to capture this fleeting time on camera, is my passion. We get so busy, once our babies are born and I am here to design and print Heirloom albums and Wall collections to last a lifetime. Who/what inspires you for your newborn photo sessions? Every photographer who poses newborns in a simple and natural way. I love timeless and simple setups with the main focus on the sweet baby. 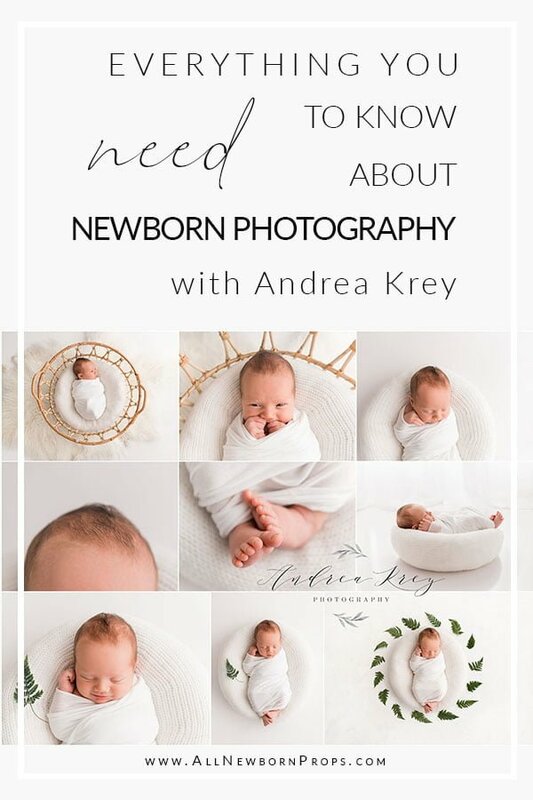 How much time is the newborn photoshoot? My newborn sessions take 2-3 hours depending on how the baby is willing to work with me. I always work on baby’s schedule. If baby wants to nurse, we nurse. If baby needs mommy’s cuddles, we cuddle. Natural light is what I prefer, but I know how to work with artificial lights as well. All bean bag shots are taken with my artificial light and I love that people don’t see the difference of light source in my images. What camera are you shooting with? What lens? I am a Nikon girl and own a D850 and a D750 as a back up camera. I use a Nikon 24-70, 2.8 for newborns and my Nikon 105mm for detail shots. I also love to use this lens for portraits in outdoor sessions. It’s definitely my favorite lens. What aperture do you generally use? 3.5 is my sweet spot. What are the tricks that you use to make newborns fall asleep? A good swaddle, my Shusher, my Dyson heater to keep the studio cozy warm and gentle strokes on their forehead. Which application do you use for making the baby sleep? None, my phone is always far away from the baby (outside the studio on my desk) and cell phones in general are not allowed in my studio (I’m just weird like that. There are 10 times more germs on the average cell phone than on a toilet seat. I just don’t want to risk anything. I prefer my Shusher or white noise teddy with vibration to put near baby). What are the must-have newborn photography props that you cannot shoot a baby without? Stretchy wraps in neutral, preferably white color are a must. I love my All Newborn Props ‘Create-a-Nest(s)’™ ( I have two, that’s how much I love them) for newborns and even for bigger babies (with the insert pouf) for them to sit on. I use it all the time either just simply placed on a white floor or in baskets and vessels. Do you find yourself using the same props almost all of your newborn sessions? If so, what are they? Generally I don’t use many different props. I keep my sessions very minimalistic. I like to keep my sessions as timeless as possible, so we can love all images now and still love them in twenty years from now. My go-to prop is my All Newborn Props ‘Create-a-Nest’™, and currently an IKEA wooden basket, which is perfect for the nest. Do you use a beanbag only or you have a stand also? I use the bean bag and a stand. I achieve the perfect pocket with the posing beans to place under all of my blankets and fabrics. Is your bean bag full to the top and firm or did you leave a dip in the middle? I left a dip in the middle. If I need the beanbag to be firm I have an additional firm layer (nap top) to place on top of the mother bean to make it nice and firm and it also protects the beanbag from peepee accidents. What do you have under the blankets? Two soft blankets, a disposable pet training pad, and three to five posing fabrics. How do you achieve that sharp, crisp look on your images? Do you use a Photoshop action for sharpness & skin tone? I try to get everything right in camera, especially when it comes to white balance. If your white balance is spot-on, your skin tones should be perfect as well. For red baby skin I apply a hue\ and saturation layer and pull out the reds. I apply a few go-to level layers which I saved into my own action and sharpen in Photoshop as well. 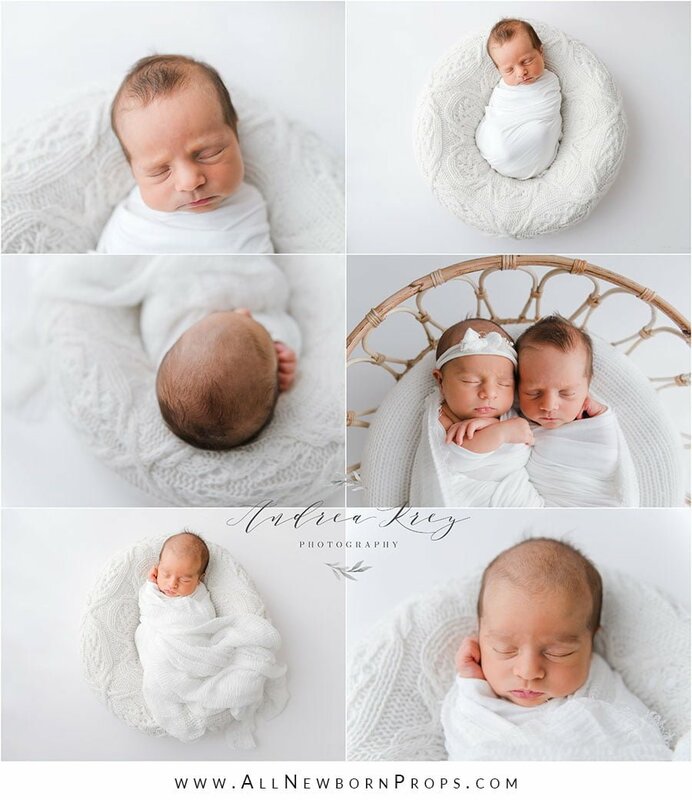 Do you have any expert tips/tricks to getting the best newborn photos for a beginner newborn photographer? Make sure baby is well fed, has a clean diaper and is warm. This makes for sleepy babies. Another tip is to always photograph down the baby’s face and body from your light source, never up their nose. The head should always be close to the light source and not their feet. What is the best email that people can reach you? Thank you for taking the time to share your advice and story with the All Newborn Props community! Thank you for interviewing me, it was so much fun! All images published in this blog post are taken by Andrea Krey. PIN IT: if you’re on Pinterest and want to save this article for later – here’s a graphic we made for you. Let me know how did you like this interview? If you like it, please share and comment. If you have more questions to a newborn photographer please leave them in a comments section and we will find a photographer to answer it! 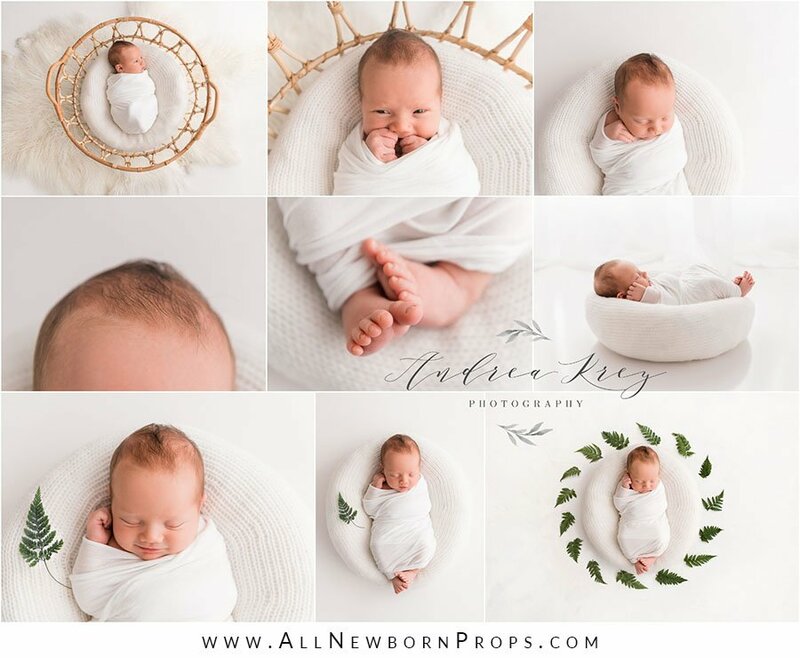 Newborn posing flow: the same 1 pose – 7 different images!